One of the weirder things I’ve worn recently, this outfit is from the weekend when we went to a friends’ grill party. 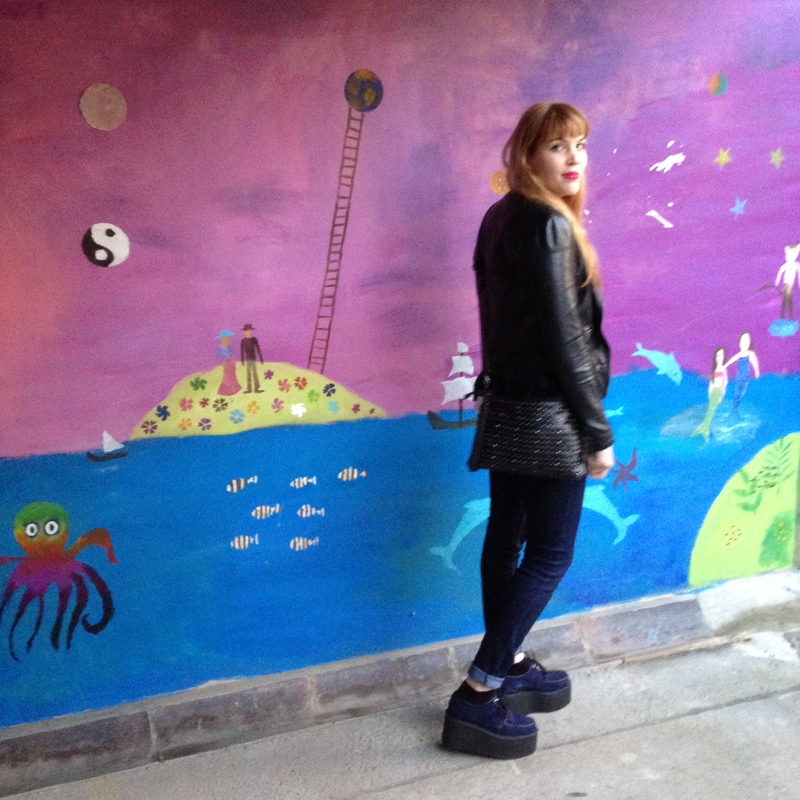 I wore my Underground dark blue suede triple sole Creepers. I love these shoes for many reasons, one of which is that they are my blue suede shoes. I mean, everyone should have a pair of blue suede shoes. I couldn’t find their product photo so here is the black version. I really think that besides the color, they are the same. Besides my lovely creeper shoes, I wore my favorite fake leather jacket (Zara) and my favorite tee – it features a washed out (I’ve worn it too many times, I guess) picture of Dead Elvis. Or well a skeleton’s skull with Elvis hair. Anyways, I layered a grey tank top underneath (H&M) both for warmth and because I like how it looks peaking out from under the tee. My skinny jeans are from Mango and I’ve blogged about this studded bag recently. I’m also wearing the Lush lip color I mentioned in a recent post. This color is really amazing and I love how long and how well it lasts. I mean – Hello! – grill party. Anyways, I probably won’t surprise you by saying that I absolutely LOVED this outfit. I was super happy that I had finally worn the shoes (well, actually, I have already worn them once during our London vacation right after I purchased them because they were SO heavy I had rather put them right on than carry them around.) But you get what I mean, right? So there’s nothing more I can say really. This was definitely an outfit that was very “me”. 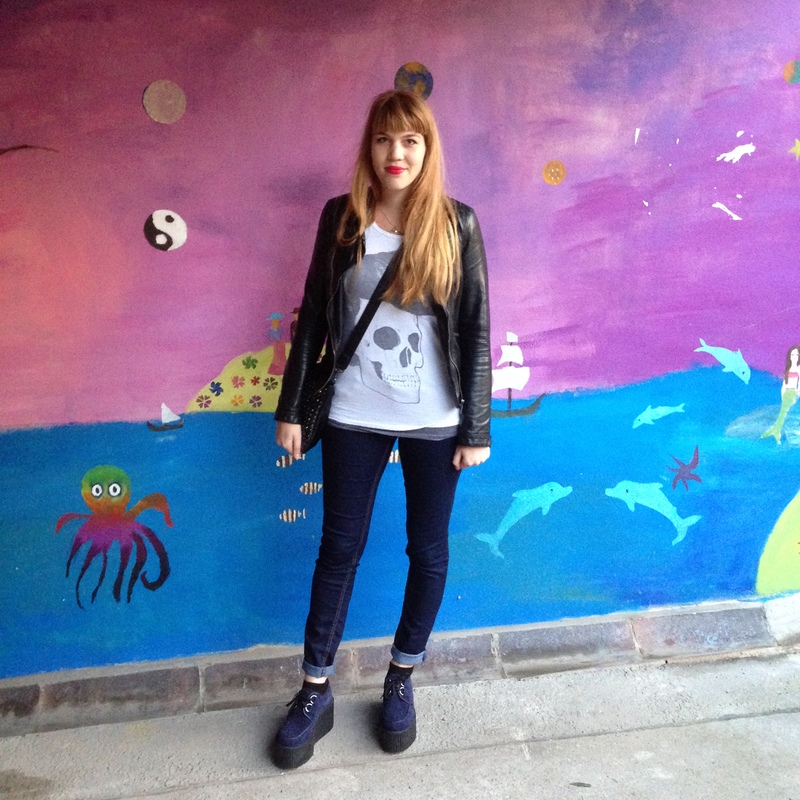 Favorite tee, favorite jacket, favorite jeans at the moment and shoes that I really love? Win-win all the way. Previous PostOotd: polkadots and plasticNext PostHug Me. Thank you 🙂 It’s definitely a “weird” outfit but I really liked it! Love it and brilliant backdrop too!